IMT Ghaziabad, India’s premier management school, witnessed a grand ceremony of the Annual Convocation 2017 on March 15th at its campus in Ghaziabad, Delhi NCR. 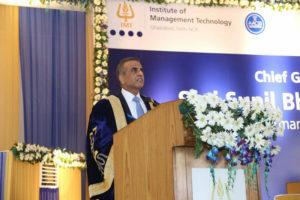 The Chief Guest at this year’s convocation was Shri Sunil Bharti Mittal, Founder and Chairman – Bharti Enterprises. Shri Kamal Nath, President – IMT Governing Council, Member of Parliament, and Former Union Cabinet Minister presided over the event and awarded the diplomas to the graduating students. A total of 545 students from six different programmes, namely Post Graduate Diploma in Management (PGDM) – Full Time, PGDM – Finance, PGDM – Marketing, PGDM – Dual Country Programme (DCP), PGDM – Executive, and PGDM – Part Time, graduated at the convocation ceremony while the faculty members, proud parents, friends and relatives watched from the sea of audience present during the event. Sunil Nayyar, Marketing Director, Sony Corp, USA, an alumnus of 1991, received the IMT Distinguished Alumnus Award 2017 for his exceptional contribution to the industry and the institute. The Vishit Jain Memorial Award was conferred upon Gagandeep Hardeep Marwaha of the PGDM 2015-17 for an all-round performance with noticeable impact and quality of achievements. “We look forward to 2017 with renewed optimism with the formation of the Real Time Contextual Marketing Lab (RTCML), perhaps a first in the country by any B-School which will see the convergence of Digital, Mobile, Social, Analytics and other new media applications. We are confident that the proposed Centre for Development Studies too will create an impact. We will continue to deepen our engagement with the industry and IMT will launch its Bloomberg Trade & Research Lab which will allow students to execute mock trades on global exchanges and gain expertise of trading in financial markets,” he added, touching upon some of the new initiatives in the offing. The convocation ceremony was concluded with the national anthem and the procession leaving the lawns. This was followed by a brief media interaction with the Chief Guest Shri Sunil Bharti Mittal and Shri Kamal Nath. Established in 1980, Institute of Management Technology, Ghaziabad (IMTG) is India’s premier AACSB accredited management school with a distinct focus on grooming Leadership through Innovation, Execution and Social Responsibility. An autonomous, not-for-profit institute, offering highly sought-after postgraduate programmes over the past more than three-and-a-half decades, IMTG currently offers four AICTE approved programmes – Post Graduate Diploma in Management (PGDM) Full Time, PGDM Executive, PGDM Part Time, and PGDM Dual Country Programme (DCP). While the first three programmes are offered at the IMTG campus in Ghaziabad, Delhi NCR, India, the PGDM DCP is offered in collaboration with IMT Dubai campus. The Post Graduate Programme in Management (PGPM) is the latest addition to the list which leads to PGDM Part Time. Today, IMTG is the proud alma mater of more than 300 C-suite executives and thousands of professionals serving in leadership positions in the best-known organisations in India and the world, in key business functions of Sales, Operations, Human Resources, Consulting, Information Technology, Marketing, and Finance, among others.